Kuomboka is a Luyana name literally meaning ‘to get out of water’. It is applied today to a traditional ceremony, which attracts more interest as a celebration of local culture each year than any other in Zambia. 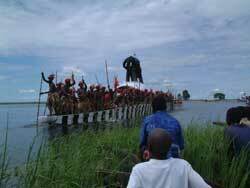 It is held when the annual inundation of the Bulozi flood plain of the Upper Zambezi River reaches such a height (up to 40 feet above normal) that the Lozi Litunga or King leads his people to higher ground. This is usually at the end of March or beginning of April. 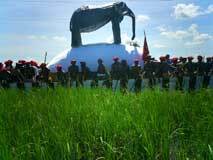 The date is liable to change each year and is kept secret by the Barotse Royal establishment until close to the day. These days, the route taken is from the village of Lealui, the capital of the Lozi Kingdom in Lewanika’s time, to Limulunga, the summer or floodtime capital which is where the Litunga spends most of his time today. The ceremony is preceded by heavy drumming of the royal Maoma drums, which sound of which echoes around the royal capital the day before Kuomboka, announcing the event. In olden days the Kuomboka took place in the context of crisis as gardens and grazing were inundated and when the mounds on which so many of the inhabitants of Bulozi lived, became host to millions of rats, snakes and the fearless white ants that could consume the very buildings that people constructed to live in. Even the snakes could not handle the ants and would hang in bushes to try to escape the attentions of the ants! The concept of Kuomboka was invented by the early Lozis as an answer to this annual problem. Not just people but cattle too had to be swum to the plain margins to graze on the harsh woodland. During that era, people were always anxious to return to their homes on the plain but for this also, they had to wait for the Litunga who would be the one to signal the return, which is today another ceremonial occasion taking place around mid-August. Here is a little of the history of this important event and the barge called Nalikwanda in which the Litunga is transported during Kuomboka. The first male king of the early Lozis, known as Luyi, was called Mboo, although his real name was Muyunda Mwanasilandu. Oral history handed down over the years tells us that Mboo was a particularly inspired leader, one correspondent saying he had qualities that a commoner could not have. One example is a seat he had made from reeds and Makenge roots called Lubona, which was peculiar in that it was so designed that when Mboo sat on it his feet could not touch the ground but would need to be rested on some sort of support. Another is the creation of the Nalikwanda. One of the prime reasons for making the change from a female to a male ruler, it is said, was to deal with the threat from the annual inundation which killed most of the Luyi livestock and drowned people and villages alike. Mboo came up with the idea of a boat or rather a barge with which to transport people and valuables to higher ground. The first barge, called Njonjola, was constructed of local reeds called Mefalingi, which were sewn together using Makenge roots and fibres. It was, it is said, constructed in parts, the sides finally being attached to the base. Clearly, this sort of craft was not very sturdy or long-lasting and soon the need for wood was realised. The sort of wood that was desired was that from which planks could be made and three sorts were chosen as suitable, Mulombe, Muzauli and Munyonga. The latter was chosen specifically for the base due to its low density, providing good floatation properties. Quite where the technology or idea of using planks came from is a mystery. Could it be that some knowledge of this sort of boat building had arrived by way of the Arabs from the east or could there have been some kind of infiltration of knowledge from the Portuguese who had interacted with the Lunda-Luba Empire by the 1600s? Clearly, as there were virtually no trees in Bulozi, this method could have not developed locally. The reed and fibre boat would have been an indigenous product using materials available locally. The question is intriguing and no answer is readily available. Three carvers were sought by Mboo for the new barge which was christened Njonjola and constructed at a village called Liaylo at the place of a man called Akabeti. Spears were sought from people living in the forest east of the plain (where iron working had been known for centuries past) and these were used to make holes in the planks using fire and through these holes were passed Makenge fibres (roots), which were used to join the planks together. Locally available bitumen-like glue called Lingongwe (made from the bark of certain trees) was then used to seal the holes. Paddling sticks were made under the supervision of Mukulwembowe, the Chief Rainmaker at Nakato village. These early barges were decorated with vertical dull scarlet and creamy white stripes using dried clay and chalkstone or dried makenge root for the creamy colour. The object was to create shades of light and dullness, which were to resemble the designs on the altars used to worship the Luyi God, Nyambe. Later the stripes changed in colour to black and white and were said to resemble a zebra’s stripes but this was not the original purpose. Thus the early Njonjola was decorated to look like a giant altar. Finally the chief carver, Induna Nambayo would be called on to supervise all the carvings and to launch the barge out for testing. The barge Njonjola became known also as Linene meaning ‘a wide thing’ and later as Nalikwanda, by which name it is known today. This latter name means ‘for the people’ meaning that it was for the use of all those who could paddle and who lived in vulnerably low areas when the flood, known as mezi a lungwangwa rose too high. The purpose was to transport people to higher ground for safety. 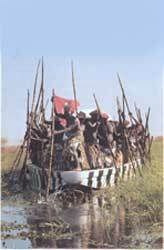 Later, the Nalikwanda was for the sole use of the King who led a procession of barges known as Kuomboka, which heralded the move to higher ground of much of the Lozi nation between early March and April depending on the height of the waters. In the pre-Makololo era this migration did not take place to any particular or regular location, it could be to any higher ground that was deemed safe. Later, when the use of the plain margins was included, families had regular flood-time homes where they took their cattle, and Kings would also choose their own Kuomboka destination. It was only during the time of Yeta III in the twentieth century that a set destination was ordained. This was called Limulunga; not the Limulunga of today but one set into the plain about a kilometre from the present village. The site of the old village and the canals that used to lead there can still just be made out today.